According to N4BB, clues found in the BlackBerry PlayBook OS 2.0, due out in February, suggest that a new BlackBerry tablet is coming with support for LTE connectivity and a screen resolution of 1280 x 768. The hint that the next RIM produced tablet would have support for LTE came from images found on the BlackBerry PlayBook 2.0 OS Developer Beta. 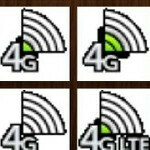 Icons were found showing a 4G and a 4G LTE logo. These are the top banner images that you would find alongside other notifications. RIM had been planning for a 4G version of the original PlayBook with Sprint originally saying that it would release a WiMax enabled version until they decided against offering such a device. Additionally, a leaked screenshot shows some support for a screen with resolution of 1280 x 768. The current 7 inch BlackBerry PlayBook screen has resolution of 1024 x 600. This higher resolution screen is most likely being tested on new versions of the PlayBook that will be run by the new BlackBerry 10 OS. With 4G LTE connectivity and a higher resolution screen, we would probably see this new BlackBerry tablet launch no earlier than sometime early next year. Blackberry... the little engine that could.